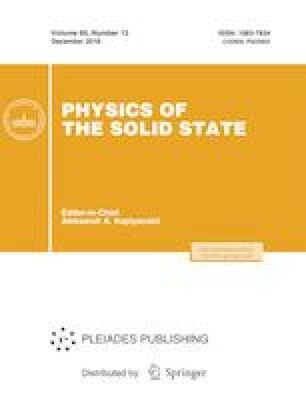 The methods of broadband dielectric spectroscopy are used to study the effect of substitution of Fe3+ by Sc3+ in Pb(Fe1 – xScx)2/3W1/3O3 solid solutions of perovskite family on the dielectric response function in the frequency range from 120 Hz up to 100 THz (4 × 10–9–3 × 103 cm–1). The experimental data are analyzed in the framework of multiparameter dispersion models. The evolution of the dispersion parameters of absorption bands depending on the degree of cation substitution in the B position of perovskite basis of ABO3 is discussed. The work was supported by the Russian Foundation for Basic Research, grant no. 16-02-00223; synthesis of ceramics and measurements in the low-frequency range were funded by the project 3.1099.2017/PCh of the state assignment of the M-inistry of Education and Science of the Russian Federation.